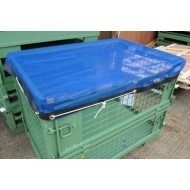 Stillage Covers are widely used in warehouses, by packaging companies, removal companies and in the transport industry. Whether you are moving cargo or simply storing stock or personal items, this net cover will provide you with aid to keep items contained whilst in transit or storage. 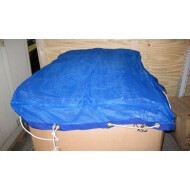 The net cover is hardwearing and can be used time and time again indoors or outdoors. The net cover material is a high quality dipped mesh with webbing sewn around the edges and comes complete with eyelets and a bungee cord so they are easy to secure. The nets can also be made from a tough open mesh depending on the intended use. We offer a range of bespoke sizes and shapes depending on your particular requirements.